I'm back again for October 2nd with another short story from 30 Tales to Give You Goosebumps. I'll be featuring one short story a day for the whole month so if you need to get caught up check the previous couple days for their entries. Benjy and Becca are starting the sixth grade. Excited at first to get the COOLEST TEACHER EVER they soon discover that they actually are having weird Mr. Blankenship. How is he weird? Well for one thing he has pet snakes in the classroom. Snakes are a genuinely creepy animal. Not enough legs, weirds people out. I have a rule about legs, no more than 4, no less than 2 (unless you're a pirate.) Plus he feeds the things live mice in front of them. Soon they realized there were tons of glass cages full of snakes. He kept adding more as time went by! Things are getting out of hand. One snake even crept home in Becca's backpack! Except it didn't because that was a dream. Still if you are having nightmares about all the snakes in your classroom there is probably still a problem there. A girl in class accidently bumped a cage one day and let one of the mice meals escape. Her punishment was to write an essay about snake feeding habits. A fitting punishment I guess. For questioning this, Becca herself got slammed with a 10 page assignment! Plus she has to clean out the snake pages for a week! But never fear. There is a plan to get even. Operation Mouse Rescue is in the works. The sneak into the school after hours to set free the mice. Unfortunately all these kids are damn clumsy and Becca falls into a cage shattering the glass. Some snakes are on the loose including a very large cobra. In fact, the cobra seems to be getting bigger... and bigger... and now it shifted into a very familiar form. The cobra is none other than Mr. Blankenship! RUN AWAY! 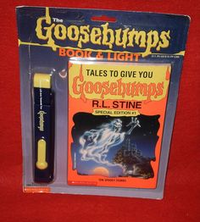 Running away is the unifying solution to so many Goosebumps stories. And it worked. Sort of. You see they did get away, but of course they still had to face their teacher for the rest of the school year. It kinda worked out though. He agreed not to tell parents the kids had snuck into the school after hours. The one caveat is that now the kids have to feed him mice each day after school. Snakes are a pretty common animal for people, especially kids, to be afraid of. I've always had a certain uneasiness around them. They just seem so... foreign. So weird. They don't walk, they slither. That is a weird way to get around, don't tell me it's not! 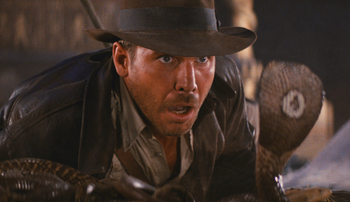 But, for how creepy snakes can be, this story came off a little bit more silly than scary. I would compare it a bit to The Girl Who Cried Monster. In that full length Goosebumps book the librarian was weird and had a dark secret. He turned out to be a monster rather than a snake, though the concept is similar. But for all the scary horrible things your teacher can turn out to be, a secret snake is not super high up on that list. The ending is played for laughs, which I get. But it could have had the chance to be scarier. What if the teacher wants to eat them? What if the teacher has been eating other kids? Maybe he has eaten the janitor! A snake that big surely would want to fill up on mice. Maybe he needs them to bring him their pet dogs? I don't know! As a silly tale, it kind of works I guess. I just think maybe it wasn't silly enough to be a really silly story, and the scares were a little lacking. Check back tomorrow for story #3 for October, "Strained Peas." I admit I am pretty hopefully. Strained peas are terrifying!